DescriptionOur children's wedding activity sets are a great way to keep your younger guests entertained during the meal. Each set includes a 5" 20 page activity book and a box of 4 assorted non-toxic crayons. 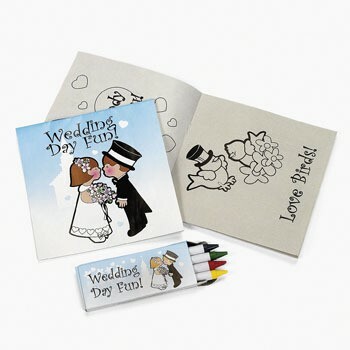 Our children's wedding activity sets are a great way to keep your younger guests entertained during the meal. Each set includes a 5" 20 page activity book and a box of 4 assorted non-toxic crayons.